Google’s January 23 image search update brought high resolution pictures directly within search results, leaving users with little incentive to clickthrough to the sites hosting and licensing the pictures. We analyzed the image search traffic of 87 domains and found a 63% decrease in image search referrals after Google’s new image search UI was released. Publishers that had previously benefitted the most from their image optimization efforts suffered the greatest losses after the image search update, experiencing declines nearing 80%. In the eleven weeks after Google’s new image search was released, there has been no recovery – which means for image search, the significantly reduced traffic levels we’re seeing is the new normal. In the aftermath of the new image search experience, image SEO has been severely compromised, and we have no choice but to recommend deprioritizing image SEO when weighed against other search traffic initiatives. This served the best of both worlds: allowing the user to see the high res version of the thumbnail, while also allowing the publisher to gain a return on the investment they’d made in the image displayed within search results. The source page will no longer load up in an iframe in the background of the image detail view. This speeds up the experience for users, reduces the load on the source website’s servers, and improves the accuracy of webmaster metrics such as pageviews. Google, thou doth protest too much. Although it made an effort to assuage site owners that this change would be better for users and for publishers (promising higher clickthrough rates in the process), the reality is that the new interface makes it a two-click process to reach the website where the image is hosted. And with this higher resolution image displaying directly within Google’s search results, there’s very little need for users to click through, since users are treated to a high res version of the image directly on Google.com. In the weeks immediately prior to Google’s Image update, the sites in this study had been making strong week-over-week gains, nearing 1.4MM referrals in aggregate. 11 weeks after the update, image traffic has remained steady at the drastically reduced numbers, plateauing around 400K image search referrals per week. Ironically of course, these are the sites that had placed the most effort optimizing their images, by meticulously following image SEO best practices, such as developing image XML sitemaps, defining keyword-rich alt tags, file names and captions, and making sure all images within galleries were fully indexable. Image SEO as a percentage of overall search traffic varies widely among sites, depending on their content strategy and how well they’ve executed their image optimization efforts. There are some sites where the percentage decrease in image traffic may be high, but because the actual image search traffic is so low, the change has not caused a noticeable decrease in overall site visits or total organic search traffic. Other sites aren’t as lucky. For sites that have placed images at the heart of their content efforts, including the implementation of the heavy-lift image SEO tactics enumerated above, a significant and as of yet irreplaceable traffic and revenue loss has occurred. For some of these sites, image search had been 20% or more of all organic traffic. With Google’s new image search, image traffic for these sites now ranges in the low teens or high single digits of all organic traffic. For the hardest hit sites, this has resulted in the loss of well over a hundred thousand image search referrals per week. Ok, So Image Search is (Nearly) Dead. Now What? It’s difficult not to consider Google’s image UI change a shameless content grab – one which blatantly hijacks material that has been legitimately licensed by publishers so that Google Image users remain on their site, and are de-incentivized from visiting others. If you’re an SEO, site owner, product manager, photo editor, developer or designer, the yield from image SEO suddenly looks much less attractive. If Google is going to only send a fraction of the image traffic it used to, there’s considerably less incentive to put in the work involved in optimizing images. Don’t get us wrong: we’re not saying that site owners shouldn’t follow image SEO best practices; what we are saying is that when force-ranking SEO priorities, this new data clearly shows that until Google changes its image UI to be fair to publishers, image SEO should be moved further down the list. Great article Shahzad. We saw Google start to keep users in their ecosystem when they added movie titles and trailers to their search results page. 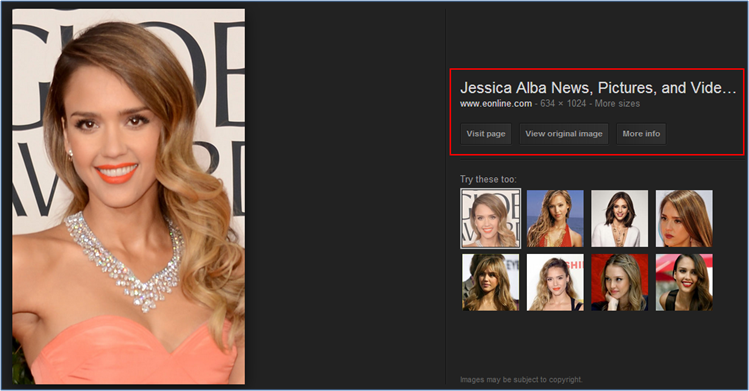 Then they added wikipedia information to search result sidebars and now image search is gluing people to google as well. I wonder what’s next. Also, do you have any idea if Pinterest referrals (or any other image site) are making up for the Google Image search referral deficit? I specialise in designing websites for visual artists so many of my clients websites are 95% images with only a splattering of text. Looks like I’m going to need to watermark images. Lost traffic but the visit Quality more than before. Great research, Shahzad. This is a huge hit but it does indeed improve the user experience which is what Google claims is their goal. Unfortunately they got this one right. Thanks for shedding light on this. I think this is a good change, and I would refer to Google’s statement as to why: “… improves the accuracy of webmaster metrics such as pageviews.” How many people actually clicked through to the website before the change as opposed to just looking at the picture and then moving on? Even if the person never even glanced at the iframed site in the background, they’d still count as a pageview, which is entirely inaccurate. It’s an imageview, not pageview. How valueable was the image SEO to begin with? Did it lead to sales, or did it just lead to people looking at an image and then leaving? Those are the kind of metrics I’d prefer to see. I definitely not agree with your analysis. As stated, before the update Google was loading in iframe the image thus meaning that a load of “ghost impressions” were generated as normally people were consuming the image (e.g. copy and paste) without moving navigating into the site at all. Plenty of users on the Google Webmaster forum are complaining about this drop in “traffic” since January, when the new interface has been rolled-out. I do personally believe the new format is better as no ghost impressions are now accounted in your Analytics. Thanks for contirbuting. It’s helped me understand the issues. This has to be costing Google money. Less traffic coming to my site means that less Adsense Ads are being clicked. This shouldn’t surprise anyone Google loves scraping content, the entire business is built on scraped content. Share images and create albums on Google+ to get benefit from images! Are users looking to see the pictures, or buy staff? – the example in this article is a good one. If they just want to see the picture (object, face, a concept) why sending them to a website when they can see it strait away in the search engine? If they, and the end might land on a sales website and compulsively buy something then how “Image SEO” is better then pop-under, whole-page multimedia banners and other crap users hate? I understand the frustration of SEO folks, but Google did right thing for users. People to use Google Image search when they look for accompanying information – and then they will click through. Google will do what it can to legally steal our content and serve it to the billion users while they monetize from it. What they are trying to do is force us to signup for their adword service in order to get traffic. They don’t care if users steal those images, or if users do not go to our pages. The most important thing is Google’s agenda is served. If you are in the travel sector like I am, you know what I mean. They will try to cut you off as much as possible. They thrash affiliates as middleman, but then they also act as affiliate when they put their own booking form on top of most hotel searches. Thanks for this excellent article Abbas. I would like to know how is the impact on revenue/goal from image search. Not only impact on visits. Maybe we have 80% decrease from visitors that aren’t the appropriate target audience. what do you think about this? Shamed to say I had no idea the impact was this dramatic. Thanks for the eye opener, Shahzad. I wonder how hot-linking is affected? That is, I wonder if the quantity of backlinks directly to images is up or down? I’m taking a gander and thinking that images can still be effective link-bait (perhaps more so now. ), because even if traffic to the site via images is down, exposure to the images is not, and it may be eve easier than before to grab an image for one’s own site. It may shift the focus on image seo away a bit from traffic and more towards garnering links and brand impressions by focusing on the optimization of a select few high-potential images, and focusing on branding your images. Maybe..? Ouch! My heart goes out to any website owner with metrics like those displayed in the graph above. We lost around 55% visitors in Real Estate Image search traffic. Data is based on the 200 top real estate website we managed. At least, Image search trafic stands for 5-8% of the global search trafic. We do SEO for French Websites related to real estate topics. As you did, we lost much time to keep up to GG Guidelines especially for Images. And now, we must explain to clients that their SEO investment related to Image search Traffic is worth nothing, or at least, that he couldn’t hope a positive ROI. Maybe that was what GG was looking for. Very interesting article, I just was looking for answers related to this topic. I think is not problem for your real estate clients. Their objective is have client interested to buy or rent a specific appartment, is not to have visitors to their sites. So, if users are interested for appartment in the image then they’ll click to see the offer. My website went from 20% google image referrals to less than 2%. I also find that with the way image link doesn’t take it back to the website and the may be copyright notice in dark gray against the black background, it’s way to easy to for people to think that these images are free to grab. I sell the rights to use my images. I need SEO and it’s very frustrating. Do you mean Google Image is the only way to search images? Yahoo, bing and other search engines have no role in searching images? The majority of everything searched for is in Google. Traffic from other Search Engines generally tends to be a very small percentage of total search traffic. Google has “at least” 70% of the Search market share. Yahoo and Bing image search is barely a fraction of Google Image search. Google has a huge share of searches. Even with Bing buying Yahoo they still don’t come close to the number of searches Google has world wide. Google is the one to please. There are other search engines out there but even Bing and Yahoo (no the same results) take a back seat to Google search. I’m finding the “new improve” GoogleImage search a pita, as is so often the case with things deaf-Google “improves” recently. I often can’t find the item I want in the page reference it gives. Instead, I’m directed to some page of the site – often a search-result page, or maybe some other random page – where the image of product might (or might not!) be found amongst thousands of irrelevant entries. Quite often, it’s not there at all, and I ‘ve wasted a load of time. Had a load of my time wasted. I’m sure it was easier to locate specifics before. Whatever google has done has shown a quick decline in search traffic via the image search, Google took the step for their own betterment but at the same time it shows that the percentage of people referred to the site are real, they just clicked the site from which the image has been shared actually but before that I have often experienced that a wrong click at the image side was used to bring you to the site 😛 from where the image was linked, i-e in the old google image search layout. In most cases these are copyright images that Google is stealing. The copyright holder/author has a right to traffic. Google has no authorisation to use/steal most of these images to earn its advertising revenue. Bing is the same. I agree. I wait with anticipation for a class action lawsuit by copyright holders against Google in the USA. I’m don’t agree with what you said at the end. I guess we will have less trafic from Google images but it could be a better quality trafic. We know that “old traffic” from Google Images didn’t transform. If we have a better tool to look for images maybe people will go less on webstites and more on Google Images but when they will do, it will be because they realy found what they were looking for ! No? No. My image searches dropped off the radar completely. With them went quite a bit of my revenue. I run multiple authority sites and I have seen a marked drop in subscribers and in revenue dollars due to lower traffic numbers. Thanks for the stick instead of the carrot Google. What Google giveth, Google taketh away. I keep saying that the more you diversify your traffic away from Google, the better. This proves my point (again). Have you analyzed the conversion rate of that traffic source before and after ? While the traffic decreases one could expect people actually clicking on the hosting website image being more qualified and therefore convert better. We had a few dips, but image traffic has increased by about 30% for us. I likes the old image search more than the new style, because I usually want to see the picture on the site, in context, and the new format makes that harder to do. Like Michael Martinez, I’d seriously consider blocking image search or watermarking all images so at least you get an impression for your brand name. I’ve never seen many conversions from image traffic, though. As an SEO – mainly in the B2C E-Commerce area – I usually see that the E-Commerce Conversion Rates of image traffic are only slightly lower than conversion rates from other “standard organic search”. So Google probably has “killed off” some business via image search. I’ve seen a bit of a decline too, fortunately I don’t rely too heavily on image traffic. Also, image traffic isn’t usually that useful. They’re typically coming to steal your image anyway. Thanks for posting Shahzad. It’s an “eye opener.” We are working on a heavy image based site and we were considering right click protecting the images and then providing an embed code for users that site the source. The idea was that they would not be able to right click in Google image search and they would be forced to click through to the site and get the embed code. But after looking at one site that is doing this, it appears that their right click protected images are right clickable in Google image results. Just wondering if you or anyone else has information on this. As being a user instead of a website owner, I like this new search. It saves time and bandwidth which I unnecessarily lost loading the website on back. Users just want to see the picture, it’s not their fault that they’re not interested in the websites. And if they are interested, they’ll simply visit the website through the link. Also, the new design gives space and lets load more images in search pages and clicking the image gives us info within a black box in search page instead of opening the image with website in background which causes bandwidth loss, and then going back to the search results which reloads all images and makes us lose even more bandwidth. The direct link to original image and different sizes of the image in the black box is also very useful. Besides, all this traffic they gained in the previous design also was of no use; the users simply looked at the image and didn’t care for the actual website. I’m happy with this new setting and that Google didn’t change it. It really destroyed the number of visits in favor of user experience. Do you think that it affects the seo effect while helping your page to get a better SERP position? I agree 100% with you Shahzad that Google’s new model of image search has been a crushing blow for site owners who used to get good traffic from image search. One of our clients had 15-20% of their traffic through image search but now that has trickled to less than 5%. So its been a huge loss. But the fact of the matter is that it is Google, it is a free service, so they are entitled to do what they want. I agree. From a best practices standpoint it’s always advisable to optimize your images. When resources are limited and time are limited however I would advise to focus on things like title tags that can actually yield some noticeable results. It’s too bad, it makes it more difficult to browse products by image and go through a variety of sites. I used to use it a bit for comparison shopping. I have blocked Image Search on many of my sites now. It’s no longer worthwhile to allow them to crawl my sites. If enough people block image search, perhaps Google will reconsider… if we’re very lucky! There are more than enough images for google to crawl for them not to give a monkeys. Even if 100,000 website owners blocked image search, they might not even notice or care. Google are a monopoly so not much you can do. Definitely the way to go, no point in having high bandwidth costs for zero gain. Ultimately, I see structured meta data like schema going the same way. Done the same thing. 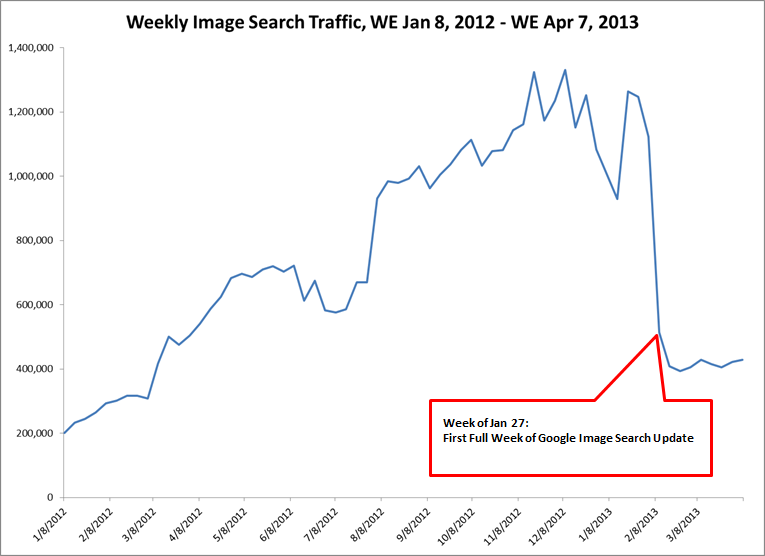 There was a huge decrease of image search traffic since Google implemented the new images search.